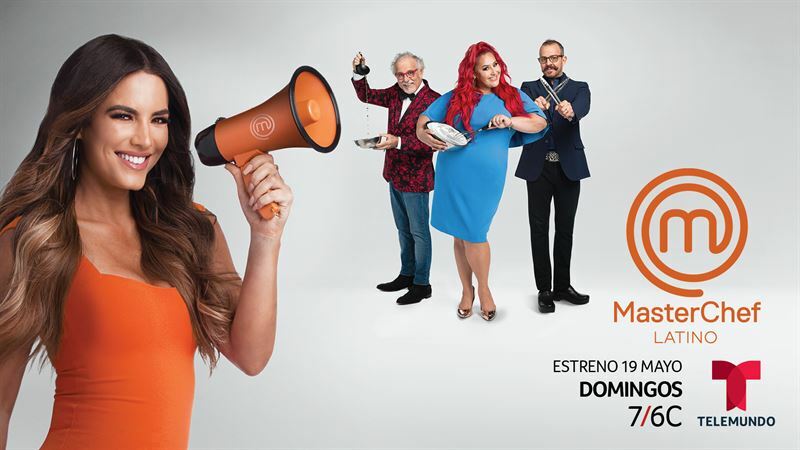 MIAMI – April 15, 2019 – Renowned actress, TV host and influencer, Gaby Espino, will spice up the Telemundo screen this summer with the grand premiere of the second season of “MasterChef Latino,” the number one reality cooking competition in the world which premieres Sunday, May 19 at 7pm/6c. Celebrity chefs Claudia Sandoval, Ennio Carota and Benito Molina return as judges of an innovative format produced by Endemol Shine Boomdog that brings together a great diversity of cultures, food and flavors from all over Latin America, where the best amateur/non-professional cooks from around the United States will do everything possible to become a culinary master and compete for a $100,000 cash prize and the coveted title of MasterChef Latino. Throughout the culinary competition, fans of “MasterChef Latino” can join Telemundo’s renowned Chef James Tahhan, who will serve as digital host to bring all the inside scoop and backstage access to Telemundo.com and the network’s social media platforms. Gaby Espino, who was recently announced as the host of the 2019 Billboard Latin Music Awards, is an internationally renowned actress, TV host, entrepreneur and one of the Latina personalities with more engagement and presence in the social media landscape, who has become an A-lister in the Latin American entertainment industry. Espino, who starred in Telemundo’s international series “Jugar con Fuego,” previously served as host of the “Billboard Latin Music Awards” and “Premios Tu Mundo.” She participated in the third and fourth seasons of Telemundo’s Super Series “Señora Acero,” and garnered acclaim as the lead actress in the network’s successful telenovela “Santa Diabla,” among many other productions. Chef Claudia Sandoval is the winner of the sixth season of “MasterChef U.S.” and the bestselling author of “Claudia’s Cocina: A Taste of Mexico.” She is the owner of a successful culinary consulting and catering company under the name “Claudia's Cocina.” An active philanthropist, Claudia’s culinary style is a modern take on Mexican coastal cuisine. Born and raised in San Diego, California, to a family originally from Mazatlán, Sinaloa, Claudia grew up with her mother and grandmother, who taught her how to cook since she was a little girl. Currently, she lives in San Diego with her teenage daughter. Chef Ennio Carota is a winner of a prestigious Michelin star and one of the most beloved and well-known exponents of Italian cuisine. His experience, wisdom and charisma have made him one of the most recognized faces of the culinary world. Ennio was born in Torino, Italy, and has traveled the world to explore the diverse cuisines of Asia, Australia, the Caribbean, North America, Latin America and Europe. He owns Pastamore, an Italian restaurant in Santiago, Chile. This master of the kitchen has become a popular personality in multiple TV shows, including his role as judge in Chile’s editions of “MasterChef" and “MasterChef Junior." Chef Benito Molina is one of Mexico’s best chefs who has worked in top restaurants in Europe, Latin America and the United States. He has become a representative of Mexican cuisine internationally and has served as judge in five successful seasons of MasterChef Mexico. Born in Mexico City, Benito is the recipient of important recognitions, including the Pintxo 2007 award in San Sebastian, Spain. He owns Manzanilla, the first Mexican restaurant in Baja California, where everything on the menu is cooked in firewood. Fans can also join “Masterchef Latino” on Instagram, Facebook and Twitter by following @MCLatinoTV and using hashtag #MasterChefLatino.